The popular procedure for rejuvenation of the forehead and eyebrow is known as a brow lift; otherwise referred to as the eyebrow lift or forehead lift. It is carried out to correct the signs of ageing, in which forehead creases and the descent of the brow has caused a worn-out or aged look. This can also occur in younger patients, leading to crowding of the eyebrow/eyelid complex giving a tired, concerned appearance. By crowding the eyelids, it can also make the upper-lid skin appear hooded, giving the impression of excess skin. The contour of the brow also changes with loss of its natural arc. Repositioning the brow and forehead not only raises the brow and enhances the eye area, but also restores the youthful shape to the browline. The aim of surgery is to restore the natural appearance of the upper facial area, which looks in line with the rest of the face. Why undergo brow lift treatment? Brow lifting is usually performed as an adjunct to upper lid blepharoplasty as a ‘Blepharoplasty Plus’ procedure . In appropriate patients, it can allow for a significant additional boost and enhancement of the blepharoplasty result. Brow lifting is not only performed for aesthetic reasons. In many cases, the drooping of the brow can actually affect vision and appropriate brow lifting can improve the lateral visual field significantly. A brow lift procedure will take between 1-2 hours, depending on the technique used. Usually, brow lift surgery is carried out under general anaesthetic as a day case. Always arrange to be picked up by a friend or family member after surgery, as you will not be safe to drive. Brow lifting is one of the most difficult aesthetic procedures and there are several ways to lift the brow surgically. One of the most common methods is the endoscopic brow lift, or 'keyhole brow-lift', which hides between three and five small incisions on the scalp, behind the hairline. A surgical telescope (endoscope) is then passed through these and is used to visualise the areas requiring lifting, via a small camera. The images are shown on a screen so that the surgeon can see where to operate on the tissue and muscles behind the hairline. The area will be lifted and stitches or tiny temporary screws will keep it in place. You won’t be able to see these due to the careful positioning behind the hairline. Internal Browpexy (transblepharoplasty). This procedure is indicated for mild prow ptosis if blepharoplasty or other upper eyelid surgery is also being considered. 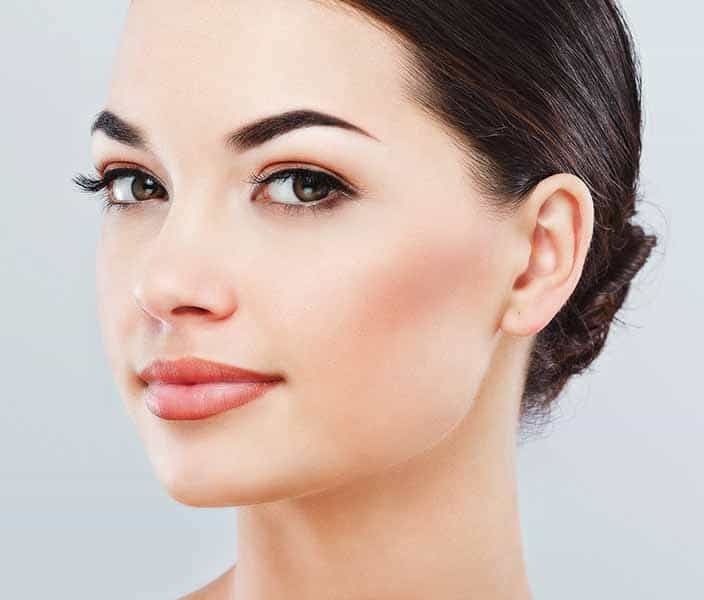 This technique offers an elegant approach to the problem and allows for a minimally invasive approach through the same incision as the blepharoplasty, meaning that there is no additional downtime. The drawback is that it is not always effective given the minimally invasive nature of the technique. Direct Brow lift. This is a powerful and effective lift which offered excellent and enduring outcomes. The downside is that there is a scar along the upper brow line. The scar is usually very light, but in patients with very thin brow hair, this can be noticeable. Chemical Brow lift. Using a combination of BoNT and filler injections, the brow can be reshaped and lifted considerably. Essentially, by weakening depressor muscles and proving filler based lift a very significant improvement can be achieved. Other procedures to address brow droop involve larger incisions along the hairline or forehead and care also offered in selected cases. During initial consultation, Mr Ezra will ask about your medical history to determine whether undergoing surgery would pose any added risks. A physical examination of the face will also be undertaken to determine the best type of surgery and how it should be carried out. Smokers should quit several months prior to surgery, since smoking can slow down blood flow and prevent a smooth and fast healing period. Medications containing aspirin and anti-inflammatories should be avoided as they can cause increased bleeding. Recovery following brow lift varies from patient to patient and the surgeon will advise you on how long you will need to be off work. Usually this is between 1-2 weeks. Patients should avoid strenuous exercise for up to two weeks. Bruising and swelling is commonplace, though there are ways to reduce swelling, such as sleeping in an elevated position with 2-3 pillows for the first week and gently applying ice packs to the affected areas. Mild pain and discomfort for a few days after procedure is also normal, and patients will be prescribed with pain medication to ease this. However, aspirin and ibuprofen type painkillers should not be taken as they can sometimes increase the risk of bleeding or bruising. Patients are advised to refrain from using hair styling products, which could irritate the surgical area. Baby shampoo may be used to wash the hair, but the areas much be thoroughly dried so as to prevent bacteria which can cause infection. Try not to rub areas dry, instead patting gently. Stitches or staples will be removed around ten days after the surgical procedure and a follow-up consultation will be arranged to review progress and ensure correct healing is taking place. It is vital that patients attend their check-up meeting. The degree of scarring after brow lift surgery will depend upon technique used, but is normally minimal. With the endoscopic brow lift method, the scars are hidden beneath the natural hairline or in the patient’s forehead creases. Scars should fade within 3-6 months of the surgery, while a temporary loss of sensation or numbness may also occur for several months post-surgery.